Used in conjunction with the PC / Component Video Transmitter over Cat5 Cable, the PC / Component Video Receiver over Cat5 Cable - 50m receives the signal from the transmitter via CAT 5/6 cable and then re-transmits it to your HDTV display. It is used to extend the overall signal distance by up to 50 metres. HD-SD Distributor 1 input : 3 output (w/Digital & Analog Audio) is a versatile, high performance amplifier for distributing High Definition (HD) and Standard Definition (SD) Video signals. Analog and Digital audio is also supported. This splitter device has the ability to distribute three different Video formats of Composite (CV), Component (YPbPr/YCbCr) and RGB (Sync on Green and Separate Sync) to multiple CRT, LCD or Plasma displays. With application for Professional and Academic presentations or Home Theatre system owners, the HD-SD Distributor 1 input : 3 output (w/Digital & Analog Audio) is ideal for use by Installation Technicians and Private users. The EDID/CEC Selector is a high performance HDMI v1.3 device that allows Users to set a firm EDID and CEC setting, simplifying signal configuration and synchronization between your source and your display. An easy and affordable way to manage embedded high definition data. DVI Splitter with HDCP Compliance allowing DVI-D Signal to be split into 2 separate DVI-D outputs. With no loss in quality on either outputs, thanks to it's buffering capabilities. PC/HD Switcher 4 input : 1 output w/RS232 allows the selection of any one of four PC or High Definition input sources to be displayed on one common Monitor. The Switch supports high resolution input of PC (VGA to WUXGA) and HDTV (480p/i to 1080p/i). Connect your PC, DVD player, Set Top Box and Cable Box to the PC/HD Switcher 4 input : 1 output w/RS232 and select the source you wish to view by simple remote control operation. Very Easy to setup and operate, this unit is ideal for use in Advertising, Business, Schools and Private Homes. The VGA WUXGA to 1080p HDMI Video Scaler is designed to scale an analog video signal from a PC source to a digital HDMI output in a wide-range of HD and PC resolutions up to 1080p and WUXGA. In addition to video scaling, the unit can convert an analog stereo audio input to digital audio and embed it in the HDMI output as 2-channel LPCM audio. This unit allows the user to select a wide range of output resolutions and supports an auto adjustment feature for optimal picture quality. 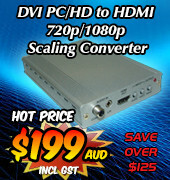 ​The DVI-D Dual-link 1x2 Splitter allows a DVI-D signal to be split into two DVI-D Dual-link outputs. It accepts both Single-link and Dual-link DVI-D signals, with support for DVI PC resolutions up to WQXGA for Dual-link DVI-D and up to WUXGA@RB for Single-link DVI-D. The DVI-D Dual-link 1x2 Splitter allows users to connect one DVI-D source for dual-screen viewing. The HDMI Video Transmitter over Cat5 transmits a HDMI signal to a Receiver unit over Category 5 cable, and is used to extend the overall HDMI signal distance. Depending on the type of receiver used with the transmitter, the HDMI signal can be extended for a distance of 50m to 250m. HDMI Splitter - 1 input : 8 output allows one HDMI input source to be displayed to eight High Definition TV's. It supports all HDMI compliant devices such as DVD players, Set-Top Boxes and Gaming Consoles, and is ideal for use in Home Theatres and Professional fields. The Video to Full HD Mini Display Port Scaler is designed to upscale any Composite video (CV)/S-Video (SV) input source into Mini Display Port output with a wide-range of selectable resolutions (up to 1080p). It allows you to display your Composite video/S-Video sources on your TV/Monitor via the Mini Display Port interface. The DVI over CAT5e/6 Transmitter and Receiver, using a DVI Extender over single CAT5e/6 cable, allows uncompressed video and audio from a DVI source to be transmitted over distances of up to 60m to a DVI or HD display (provided the HD display has DVI output). This device is useful for a number of applications, including home entertainment, lecture displays, retail sales or commercial advertising displays, or business/educational presentations. The HDMI 4k2k 1x2 SD-HD Scaler is designed to scale UHD 4k2k and SD-HD HDMI signals to full HD 1080p on the 'Scaler' port output and bypass all, including 4k2k, on the 'Bypass' port output. An input UHD 4k2k signal can be down-scaled to 1080p on the 'Scaler' port, while still being UHD 4k2k on the 'Bypass' port. The HDMI 4k2k 1x2 SD-HD Scaler allows UHD 4k2k video to be shown on HD displays connected to the "Scaler" port, while a 4k2k display can be connected and watched simultaneously on the "Bypass" port. Input HD 1080p signals will be HD 1080p on 'Scaler' and 'Bypass' ports. Used in conjunction with the DVI Over CAT5 Transmitter, the DVI Over CAT5 Receiver Box - 250 meters receives a DVI signal from the transmitter utilizing a Category 5 (CAT5) cable, and then outputs via DVI to your display. The device is used to extend the overall DVI signal distance by up to 250 meters without any signal loss or degradation. Used in conjunction with the HDMI Video Transmitter over Cat5 Cable, the HDMI Video Receiver over Cat5 Cable - 250m receives a HDMI signal from the transmitter utilising Category 5 cable and then re-transmits it to your HDTV display. 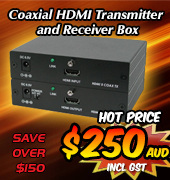 The HDMI Video Receiver over Cat5 Cable - 250m is used to extend the overall HDMI signal distance by up to 250 metres. DVI Digital Pattern Generator is designed for testing digital displays LCD, Plasma, Rear Projector. It has digital DVI RGBHV output. Built-in output formats include PC and HDTV resolutions from VGA to WXGA and 480p to 1080p/i. Easy to setup and operate with multi-choice output test patterns. The USB (Universal Serial Bus) to HDMI Converter with RJ45 is designed to allow you to use your HDMI TV as the primary display for your PC, using a USB 2.0 port. The ethernet port allows you to share a HDMI display with multiple users through your existing office or home network. The HDBaseT HDMI over Single CAT5e/6/7 Receiver with LAN/PoE/RS-232/IR can receive uncompressed video, audio and IP data over a single run of CAT5e/6/7 cable, to a distance up to 100 metres. Added benefits include control through the built-in RS-232 and IR ports and a bidirectional LAN serving connection. Also, the transmitter is powered by the PoE function of the receiver, allowing for greater flexibility in installations. The HDBaseT HDMI over Single CAT5e/6/7 Receiver with LAN/PoE/RS-232/IR is simple to instal and operate. The Wireless PC to TV Converter can send video/audio signals from a smart phone, PC or Notebook through Wi-Fi to a TV and use it as the primary display. The Wireless PC to TV Converter is designed as a DLNA DMR (Digital Media Renderer) which means users can easily send audio, video and pictures from a computer wirelessly to TV. The DisplayPort 1 In 4 Out Splitter allows a single DisplayPort input source to be displayed on four DisplayPort output monitors simultaneously. It supports video resolution up to 2560 x 1600 and audio up to PCM 7.1 The DisplayPort 1 In 4 Out Splitter provides a fast switch between source and display and saves EDID's reading sink time to allow image to display properly. HDMI Matrix Selector 4 input : 2 output allows four HDMI sources to be directed to two HDMI display panels. Any HDMI source can be directed to one or all of the HDMI display panels. 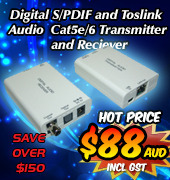 Ideal for use with HDMI devices such as DVD players, Set-top boxes, Game consoles and Multimedia centres.